If you are looking to boost your book sales or your exposure, you’ve come to the right place. Incredibly affordable promotion, with real results. 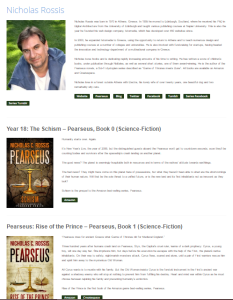 We design Author pages, list author’s personal bios, list as many books as they have written/wish to promote, and also provide links to purchase. For an example of this, why not visit Sam’s page here. Then, we utilize our substantial social media accounts to spread the word about our members! Do check us out at @SelfPubShowcase and @SelfPubShow2 – where we now have over 300,000 fantastic followers, Facebook and Pinterest for an idea of what we do and how we do it. You can also visit here to hear what our amazing authors have to say about us. This is also available as a LIFETIME MEMBERSHIP: PLATINUM option for $239 – A one-off payment for the above package, for life. An Author Page | Daily tweets to over 300,000 | Interviews | Blogging | New Release Posts | Two free Book of the month additions during the year. This is also available as a LIFETIME MEMBERSHIP: GOLD option for $119 – A one-off payment for the above package, for life. That’s over 350 tweets a year, every year. No further payment needed. This is also available as a LIFETIME MEMBERSHIP: SILVER option for $79 – A one-off payment for the above package, for life. That’s over 180 tweets a year, every year. No further payment needed. Sign up for any of our recurring membership options using the PayPal drop-down menu. Use the ‘Buy Now’ option for the one-off Lifetime memberships. Our team will be in touch within 12 hours to inform you of the information we’ll need to get you all set-up. Hint: It’s pretty much just your bio, book covers, blurbs and purchase links. Make sure you add PAUL@SELFPUBLISHERSSHOWCASE.COM to your email addresses so our response doesn’t hide in your spam/junk folder. Please note: Monthly subscriptions will automatically charge each month until canceled. Likewise, with the annual membership – you will be charged every 12 months until canceled. You can cancel anytime. You can also be listed for an entire month as our Author of the Month (for a one-off $40) or add a book to our books of the month (for a one-off $15 for a month). Just contact us below to request. Both are emailed out each month as part of our monthly newsletter. I’d Love To Join, What Do I Do Next? Email us via the form below and let us know which Membership option or Free-Book Boost you wish to proceed with – or both, if you wish. We’ll get back to you within twelve hours with your invoice and details of the information we’ll require to get you started. Don’t worry; it’s all pretty straightforward. Any questions please do ask – We are here to help as much as we can. Make sure to add Paul[at]Selfpublishersshowcase[dot]com to your contacts – we don’t want our replies wasting away in your spam folder. We’ll then send you an Invoice – do check your Spam/Junk mail if it doesn’t appear in your Inbox. Once this is settled, your page or boost will go live within forty-eight hours of settlement, or on your chosen date(s). Of course, if you just have a question about any of the above, do let us know. We are always happy to help answer any queries in a timely manner. Please answer the 2 simple captcha additions when using the contact form below, to prove you are not a computer bot. Thank you.